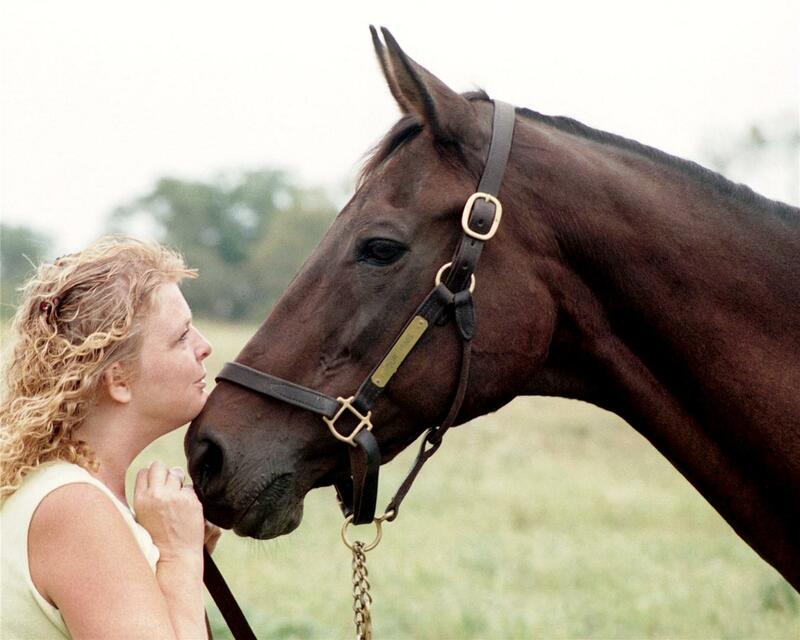 Jeanne Mirabito was 17-years-old when she saw Calumet Farm champion, Our Mims, win the Coaching Club American Oaks on TV. Although she meant to exclaim to her family, “I will own a horse like that someday,” she instead said, “I will own that horse someday.” Years later, after finding Our Mims in a cattle field, her prophecy came true. Jeanne found a retirement facility to take in Our Mims, and eventually purchased a farm and adopted the famous mare. Now, The Our Mims Retirement Haven in Paris, Ky., is a unique equine retirement facility specializing in older broodmares (plus one grandson of Our Mims, 1997 Breeders’ Cup Sprint winner Elmhurst). After relocating to Kentucky in the late 90’s, Jeanne and her husband rented a house on a farm. The farm offered her a job, which in less than a year, led her to the field where she found Our Mims. The connection with Our Mims sparked her interest in older mares, and Jeanne has been caring for retirees on her farm since 2000 (Our Mims Retirement Haven became a 501 (c) 3 in 2006). Jeanne continues her goal of “bringing the plight of the older horse to the limelight,” with 11 horses, most of which are retired broodmares given to the program by their owners at the end of their broodmare careers. There are 65 horses on first-come-first-served waiting list to retire to Our Mims, but priority is given to horses in eminent danger. Cruella, a stakes placed race horse and dam of grade 1 winner, Diazo, was in such danger when Jeanne received a call from Cruella’s groom. The groom was leaving the farm where Cruella lived, and the owner said he would euthanize the pensioned broodmare with no one to care for her. Jeanne created more stall space to bring the mare home to Our Mims Retirement Haven. There is one man among the ladies at the haven – Breeders’ Cup Champion Elmhurst. Elmhurst, a gelding, was originally retired to a riding school in California, but his attitude didn’t suit his new career. For years he flew under the radar as no one at the riding school knew of his accomplishments at the track. He eventually went unused because of his disposition, but the staff knew there was something special about him. After researching his race record and lineage to Our Mims, Jeanne was asked if she would like Elmhurst at the farm. Elmhurst has been king of the harem ever since, but is especially found of a miniature horse at the farm named Teabiscuit. TCA grant funds from 2012 and 2013 were dedicated to a new hay shed serving the ladies (and Elmhurst) well.